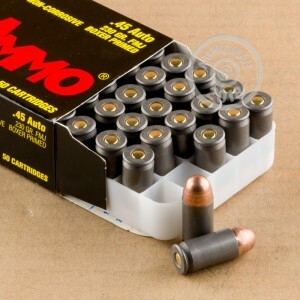 This steel cased ammunition is a cost-effective range load suitable for 1911s and other .45 Auto pistols. Manufactured in Russia by Tula, these rounds come in boxes of 50 and fire a 230 grain bimetal jacketed bullet at 850 feet per second. Tula ammunition uses non-corrosive Berdan primers and non-reloadable steel cases with polymer coatings for reliable cycling. 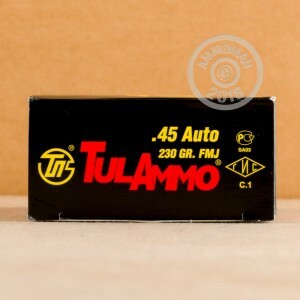 While a very good value, this ammo may not be permitted at all indoor ranges due to its magnetic properties. 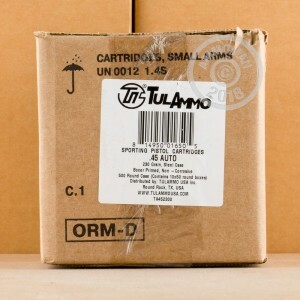 Save even more on this ammo at AmmoMan.com, where all orders over $99 ship for free! No problems with ammo and price was great.